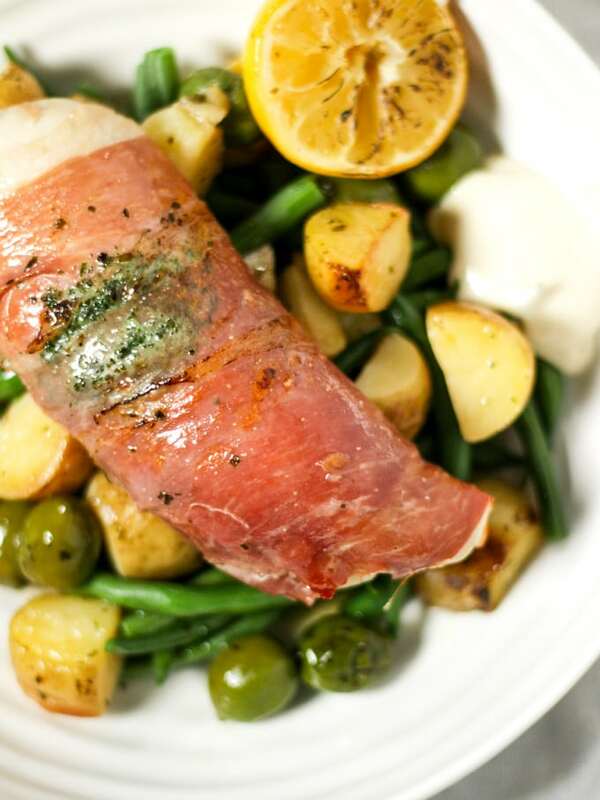 This Bacon Wrapped Chicken is a quick and easy mid week dinner recipe. Stuffed with herb butter and baked in the oven, it’s also gluten free. Hello Chicken Wrapped in Bacon! I haven’t cooked this simple dish for so long, so when it was on the list of new #BeautifullySimple recipes from Waitrose & Partners I jumped at the chance to make their version. 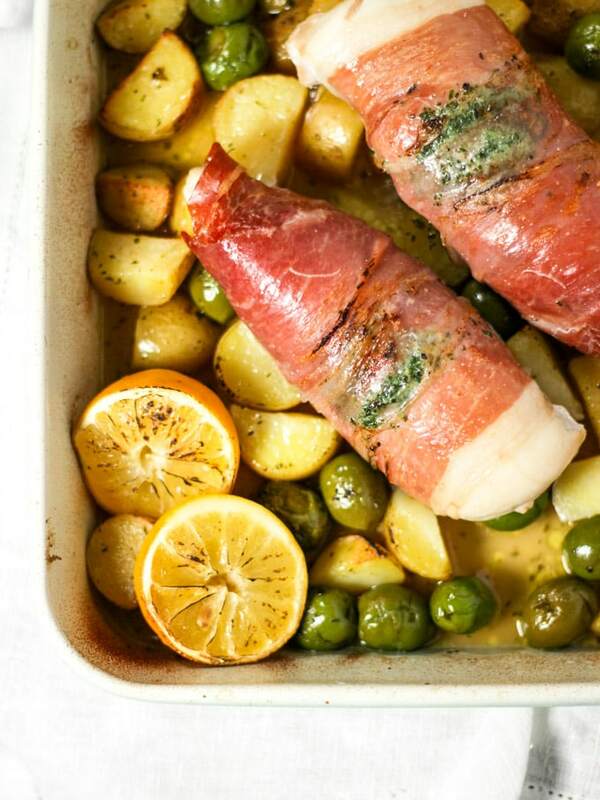 Their recipe card is called ‘Baked chicken and prosciutto with olives and lemon’ and is available in store now. 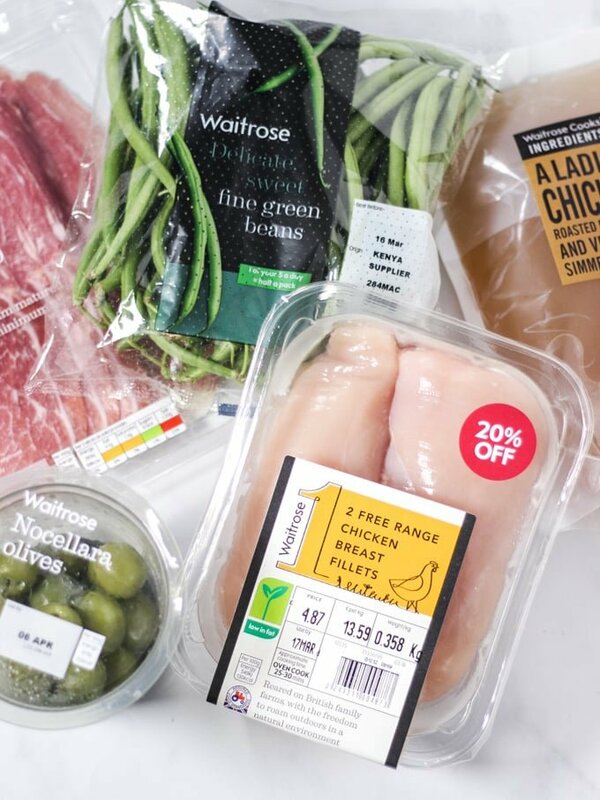 All of the #BeautifullySimple recipes use brilliant ingredients only available at Waitrose & Partners to speed up midweek meals. This is no exception, cleverly using pre prepared Charlotte potatoes, with a herb butter, to double as a chicken breast stuffing. Preheat your oven to 220°C, gas mark 7. 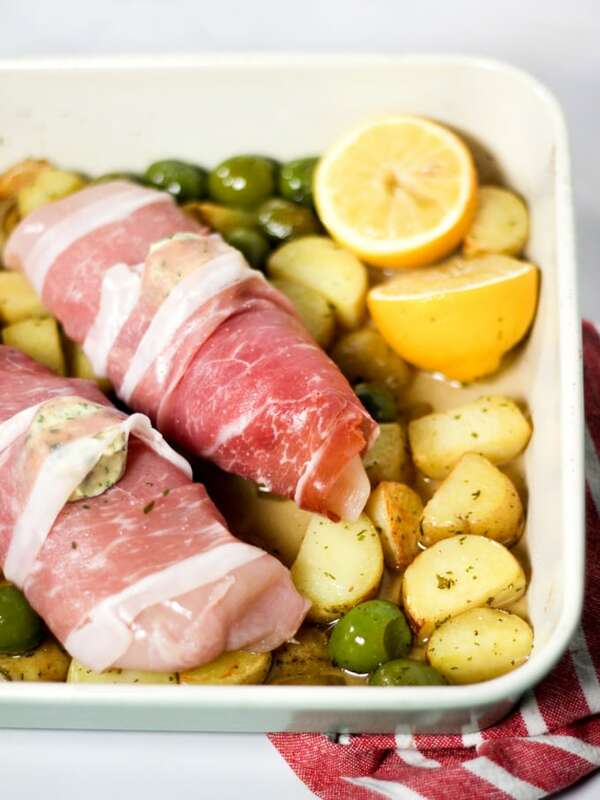 Place the potatoes with the bashed garlic and olives into a medium baking dish and tuck in the lemon slices, season and roast in the pre-heated oven for 15-20 minutes until the potatoes are starting to colour. Meanwhile, heat the stock and dot the butter reserved from the potatoes over the chicken breasts then wrap each one with 3 slices of the prosciutto. 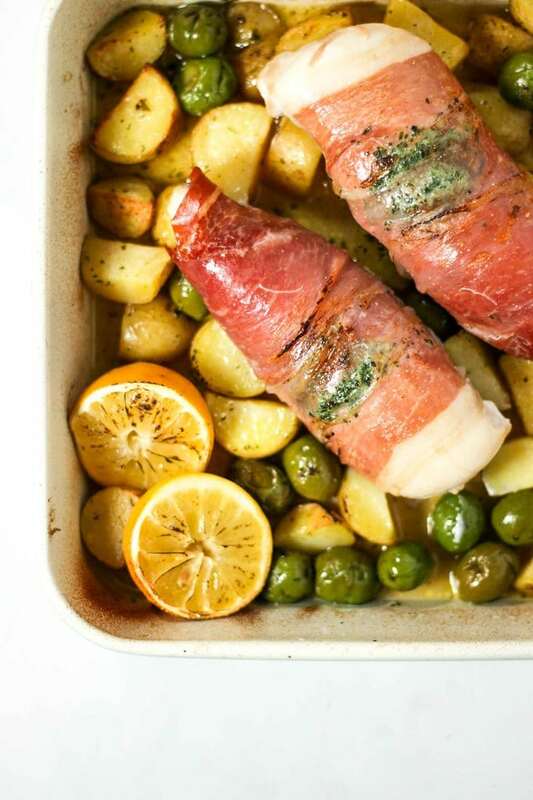 Place the Bacon Wrapped Chicken into the baking dish, pour the stock over the potatoes and roast for a further 20 minutes, or until the chicken is cooked through, the juices run clear and there is no pink meat. Cook the green beans according to the pack instructions. When the bacon wrapped chicken is cooked and the potatoes golden, squeeze the lemon wedge over it, season with freshly ground black pepper, then loosely cover and let the chicken rest for 5 minutes. 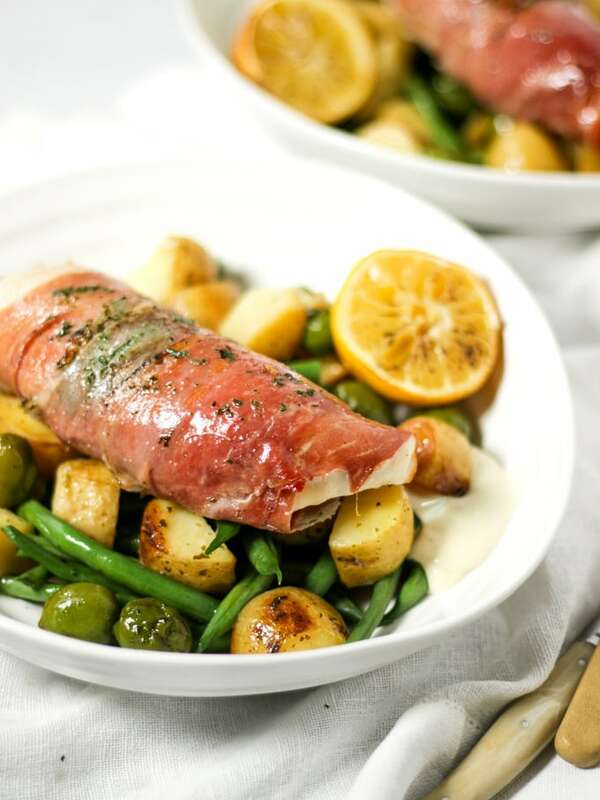 Serve the Bacon wrapped chicken with a dollop of mayonnaise and the cooked green beans, letting the mayonnaise melt into the juices on your plate. Enjoy! 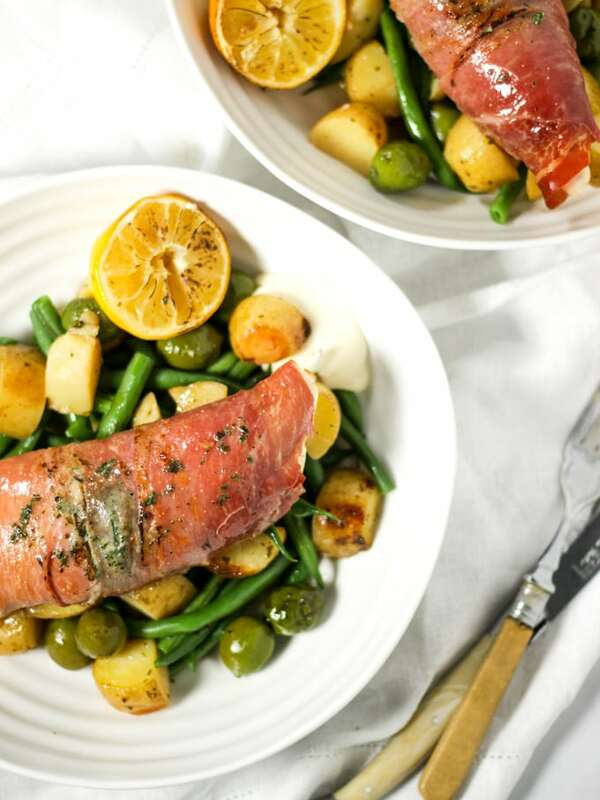 This recipe uses Prosciutto, which is an Italian dry cured ham (source). 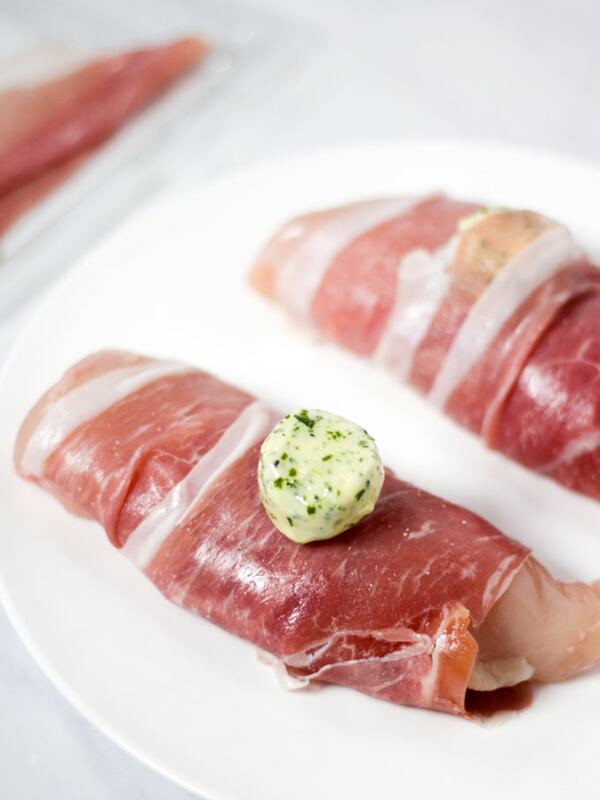 You can substitute streaky bacon if you’d prefer, but Prosciutto gives a delicious smokey flavour and is so thin that it’s really easy to wrap the chicken. The slices are also wide, which means that the chicken holds it’s shape better than with streaky bacon. If you would prefer Bacon Wrapped Chicken Thighs you could substitute chicken breasts for thighs. Chicken thighs may take slightly longer to cook, so just be sure to adjust your timings accordingly and check that they are cooked through before serving. Bacon wrapped chicken with cheese? If you want to add an extra step to the recipe you could also stuff the chicken with cheese. To do this, simply make a slit in the chicken breast using a sharp knife. Place whichever cheese you fancy in pocket you have made, before wrapping it with the bacon or Prosciutto. You could add cream cheese, or a slice of mozzarella, a wedge of brie or even some blue cheese. You could also stuff the butter inside the chicken by making a slit into the chicken breast, and then wrapping it in the bacon like a cheats Chicken Kiev. Be careful not to overcook the Chicken, check it and remove from the oven as soon as the juices run clear. Any leftovers make the perfect lunch, you could make the bacon wrapped chicken 3 days in advance, great if you like to batch cook. Simply re-heat until fully heated through. This recipe is also suitable for a Gluten Free diet. Fancy some more simple chicken recipes? How about my Pesto Chicken Bake or Lemon Asparagus Chicken ? Hope you enjoy this recipe as much as we did. I’d love to know how you got on and what you thought of it if you make this Bacon Wrapped Chicken recipe. Please rate the recipe and leave me a comment below if you do. Also, if you fancy showing me a photo by tagging me on Instagram (@tamingtwins) and using #BeautifullySimple, I LOVE to see your creations. 1 Unwaxed lemon 4 thin slices plus a wedge to squeeze. 125 ml Waitrose Cooks’ Ingredients Chicken Stock Found in the refridgerated section. Preheat the oven to 220°C, gas mark 7. 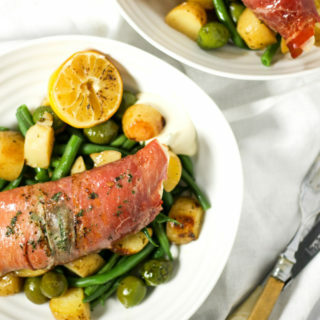 Place the wrapped chicken breasts into the baking dish, pour the stock over the potatoes and roast for a further 20 minutes, or until the chicken is cooked through, the juices run clear and there is no pink meat. Cook the green beans according to the pack instructions. When the chicken is cooked and the potatoes golden, squeeze the lemon wedge over the dish and season with freshly ground black pepper, then loosely cover and let the chicken rest for 5 minutes. Serve the chicken with a dollop of mayonnaise and the cooked green beans, letting the mayonnaise melt into the juices on your plate.